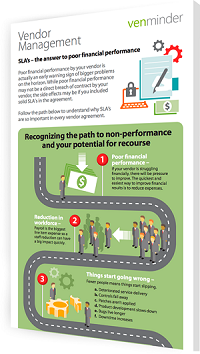 CU + Bank Vendor SLA's - Answer to poor financial performance? Poor financial performance by your vendor is actually an early warning sign of bigger problems on the horizon. While it may not be a direct breach of contract by your vendor, the side effects may be if you included solid SLA’s in your contract. We've created a simple infographic to help you and your team understand why SLA's are so important in every agreement.